Amazing Camelback Mountain Views from Villa overlooking 2nd Fairway of the Phoenician Resort Golf Course. 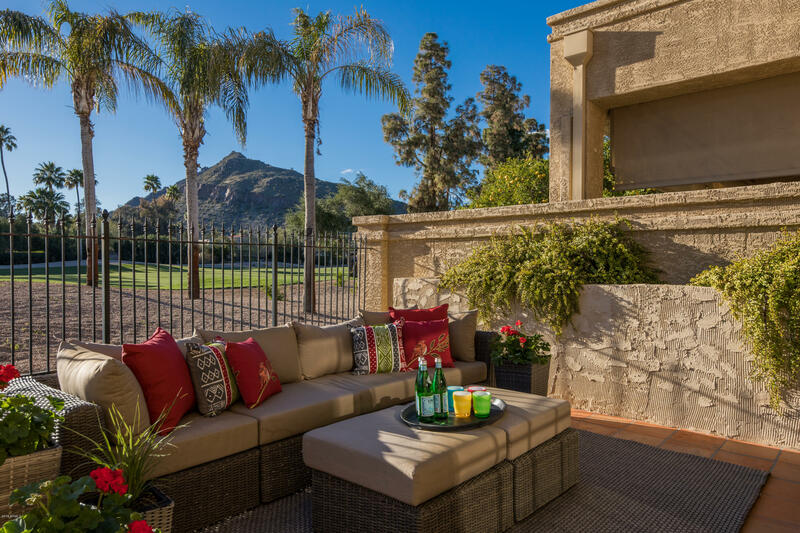 Private Guard Gated Community offers a Turn-Key Resort Lifestyle only blocks to Scottsdale's best Shopping, Dining, Galleries and Vibrant Venues. This 1630sf of Open Living Space feels much larger due to 15' Vaulted Ceiling, Soaring Windows and Fireplace. Floors are Wood and Tumbled Travertine throughout. Kitchen has Upgraded Cabinets,Stainless Appliances,Wine Frig, Granite, and Laundry area with Full Size Washer/Dryer. Split master has massive Camelback Mountain views, Walk in Closet and Master Bath has Jetted Tub, Double Sinks and separate Shower. Second bedroom has Walk-in Closet and opens to Full Bath. Remote Controlled Blinds throughout and remote Sun Shade on Patio. Move-In Ready PHOENICIAN EAST VILLA 175 4640 N 65th Street Scottsdale, AZ 85251 $750,000 Move In Ready COMMUNITY FEATURES: Guard Gated Community Guards provide Concierge Level Service Located Phoenician Resort Golf Course Community Heated Pool and Spa Private Streets & Lush Landscaping Camelback Mountain views VILLA FEATURES: Villa: 1630 SF / Open Floorplan 2 Bedrooms with 2 Baths Patio Faces Camelback Mountain 15' Vaulted Ceilings and Soaring Windows Corner Fireplace in Great Room Additional Features: Custom Recessed and Lighting Fixtures Tumbled Stone and Wood Floors throughout All Windows feature Remote Control Sun Shades Granite Counters/Upgraded Custom Backsplashes Tumbled Stone Floors in both Baths + Entry Soaking Tub + Walk-in Shower Bronze Fixtures Throughout Stainless Steel Suite of Appliances + Wine Cooler Full Size Washer/Dryer Patio with Full Extend Remote Control Sun Shade 1-Car Garage with direct access into Villa & 1-Car Carport Built: 1985 HOA: $600 per month Taxes: $4111.00 in 2018 Land is owned/Fee Simple Central Air Fenced Yard/Sprinkler System Guard Gated Community Phoenician East - A Resort Community of 93 Golf Course Villas Scottsdale Activities & Adventures A vibrant cultural and adventure destination, Scottsdale, Arizona, offers an array of exciting activities, attractions, and events as well as an alluring nightlife and world-class shopping. Set in the beautiful Sonoran Desert, bordered by Phoenix to the west, Scottsdale is bursting with unique attractions, invigorating outdoor activities and unforgettable adventures that captivate your spirit. Enjoy hiking, biking, horseback riding and desert eco-tours under idyllic blue skies or trek the city's scenic trails. From theatres and museums to sporting events and culinary festivals, Scottsdale is an urban oasis in the desert. Experience the culture and art of Scottsdale at attractions like the Scottsdale Museum of Contemporary Art, Heard Museum, Scottsdale Center for Performing Arts, Phoenix Zoo, and Cosanti, home and studio of renowned architect Paolo Soleri. Celebrate the rich history and native cultures of Arizona at annual festivals such as Scottsdale ArtWalk, Scottsdale Arabian Horse Show and PGA's Phoneix Open. Explore the Scottsdale Arts District with art galleries, museums and art festivals that capture the spirit of the Southwest.